What are the axes on the interferometer graph? The horizontal (x) axis of the graph represents the pixel number of the CCD line array. The vertical (y) axis represents the light intensity for the given pixel in arbitrary units. 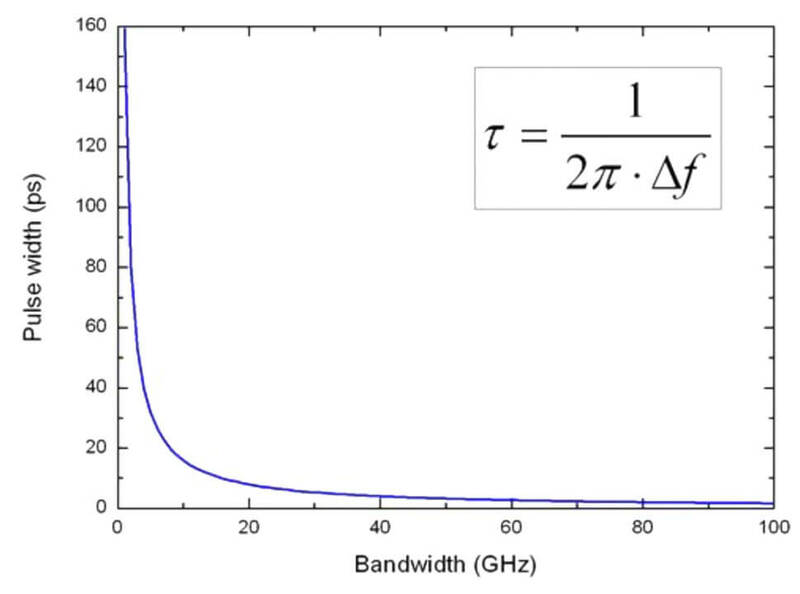 The graph therefore shows the direct measurement of the interference patterns focussed on the array. It is important to note that this is not the spectrum! However, some spectral information can be gained out of the interference pattern, e.g. if your laser is running single mode or if it there are any sidebands. What is the minimum and maximum power my device can manage? The minimum input energy required differs for the several wavelength ranges. Please see the graph below for sensitivity information of our products. Standard fiber optical patch cords and the FC/PC connectors can endure up to 300 µJ. Higher energies will most likely damage the fiber input. CW lasers: in the UV range the limit is 5 mW, in the visible or IR range 20 mW. HighFinesse wavelength meters usually only need a few µW, this should be more than sufficient, even when transmission losses through the multichannel switch are taken into account. Pulsed lasers: the recommended maximum peak power is 2 W in the UV, up to 5 W in the IR range. High power versions of switches can be ordered. Note: 20 W peak power equals 20 µJ for 1000 ns pulses, 2 µJ for 100 ns pulses, and 0.2 µJ for 10 ns pulses! For measurements of short pulses please use long exposure times and integrate over several pulse trains to get the required µJ/sec for a good signal. The actual damage threshold of a HighFinesse wavelength meter is not relevant because it is not possible to enter the wavelength meter in a free-beam manner. Please be aware, that the CCD of a wavelength meter will be overexposed long before the damage threshold is reached. This means that the necessary input energy for a properly illuminated measurement will always lie far below the wavelength meter’s threshold. What kind of pulsed measurement is possible and what is the accuracy? The shorter a laser pulse is, the broader the spectral width of this laser. Laser pulses shorter than 100 ps can only be measured by the D option (Diffraction grating) or our spectrometers. The accuracy of the wavelength meter is determined by the length of the longest interferometer inside the optical unit. The longer the interferometer, the smaller the spectral width of the laser has to be. If the laser is broader than the “free spectral range” (FSR) of the interferometer, the interference vanishes and no signal can be analyzed. The FSR can be found in the product description and in the datasheet brochure. Look at each wavelength meter type at the line “Fizeau-interferometers (Fine/wide mode)”. The upper limit for the spectral width of lasers which can be measured with each wavelength meter is roughly 40% of the FSR. Please inquire with our service, in case your laser might exceed these limits. Or have a look at our spectrometers, which can measure broad lasers (LSA) and broad band spectra up to 600 nm (HDSA). Also for each model (except WS5) there is, in addition to the standard “Fine Mode”, a so called “Wide Mode”. In this measurement mode the longest interferometer will be ignored for the calculation. For instance, the WS7-60 is able to measure lasers with a maximum spectral width of 8 – 12 GHz in Wide Mode. In normal or Fine Mode, only lasers with a spectral width smaller than 3 GHz can be measured. Note: The maximum accuracy is limited by the linewidth of the laser. Typically the accuracy is a factor of 3 – 5 smaller than the laser linewidth. So, if the laser has a linewidth of 10 GHz, the highest accuracy obtainable is approximately 2 GHz. What is the difference between good and bad illumination? Always make sure to use an FC/PC connector towards our wavelength meters and multichannel switches. Measurement results will suffer if FC/APC is used instead. To ensure high accuracy for all measurements, please adjust the optical setup so, that the interferometers are illuminated evenly. Good illumination means the peaks have approx. 60 % of the screen height (at least 1000, better 2000) and the height does not vary by a factor of more than 2. The same principle has to be followed while using singlemode fibers. Usually the height distribution of the peaks is more consistent due to the singlemode transmission. Should you use singlemode fibers below their cut-off, multimode effects will come into play and an even distribution has to be achieved for better accuracy. The file is a compressed RAR file that can be uncompressed with programs like WinZip or WinRAR. Alternatively you can rename the file to “HFDrvUpdatePkg.exe”. It will become a self-extracting archive that you can simply execute by double-clicking. Please confirm to overwrite already existing files during installation. After the installation of software and Driver Update Package simply connect your wavelength meter. You can then start the software and make your measurements. HighFinesse offers help in the interpretation of interference patterns. For this we need a raw data recording (interferogramm and further device parameters) of the measurement of interest. A Long Term Recording (LTR file) includes all measured values such as wavelength, pressure, and temperature time independently. It also contains some device information like interferogram data, used calibration and software settings. No user information is stored. Please read the next FAQ to know how a LTR-file is recorded. How to generate a LTR file? Please read chapter 2 of your printed manual, run a measurement and make sure everything is adjusted well and the exposure time allows a quite good signal so that half of the interferometer charts is illuminated. Stop the measurement and start the recording by selecting “Operation | Start | Recording ...” and choose a filename and location for the recording. Immediately after closing the dialog the recording will start and the measurements will be saved until you press “Stop”. It is not necessary to produce very long recordings as the filesize is growing strongly with the measurement count. Usually up to 100 measurement points are more than enough. You may choose to record for a longer time to depict the phenomenon at hand. - and complete folder "calibrations"
You can find these files in the program folder of your device. Please copy and complete the folder path into the file explorer of your choice. Otherwise the Windows folder settings have to be changed to “Show hidden files, folders and drives” to see the hidden folders. Why does the multichannel switch show the same picture on all channels? Most likely the multichannel switch is not actually switching channels. 1. Please check if all communication and power cables are connected. Some switches have an external power supply. For COM-port connected switches check the COM-port settings as well. Ensure everything is plugged in and you chose the correct COM-port and baudrate +(usually 57600, however older versions use 9600). What is the temperature and pressure stability of my wavelength meter? 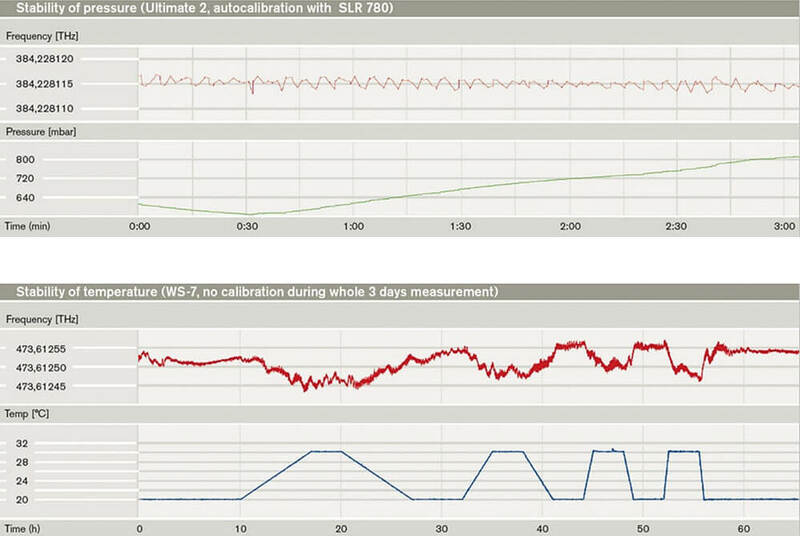 In the upper diagram above you can see a sample measurement of our WS-Ultimate series with an accuracy specification of ± 2 MHz. The measurement effectively is not influenced by the pressure change from ca. 560 to 800 mBar. To achieve best results, the wavelength meter should reach a thermal equilibrium with its environment, before starting a measurement. Usually it is enough to keep it in the lab for 1 – 2 hours right before the measurement. As the temperature of the interferometer is measured and considered in the calculation, slow temperature changes do not influence the accuracy. 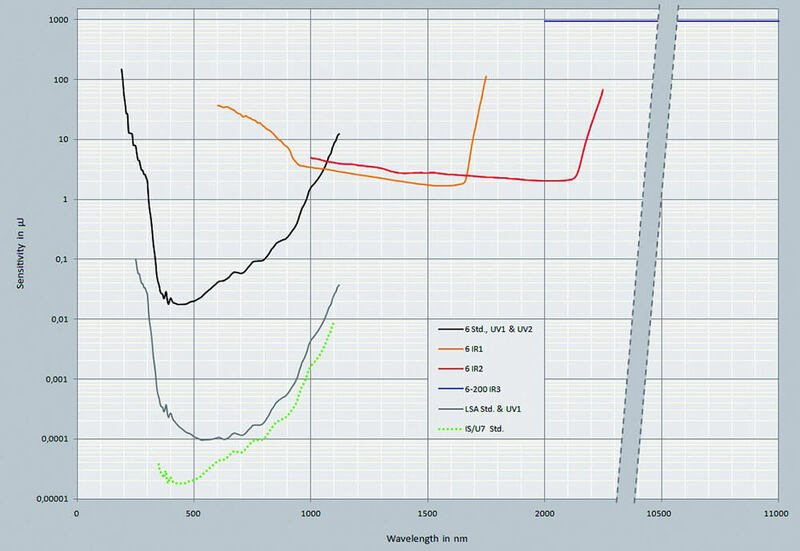 In the lower diagram above you can see the temperature stability of our WS7. The wavelength meter was kept in a climate chamber for several hours while changing the temperature drastically. As long as the change is below approx. 2 °C/h, the temperature drift is compensated quite well. When do I need the external trigger option (TTL)? All wavelength meters can measure cw and pulsed lasers. In case a pulsed laser is coupled to any HighFinesse wavelength meter, it automatically detects incoming pulses and calculates the wavelength. It will handle any laser as quasi-cw, whose repetition rate exceeds the maximum measurement rate of the wavelength meter. This option allows to externally trigger the wavelength meter for pulsed measurements. This can be useful in several situations, e.g. when only every other pulse needs to be measured, low duty cycles, strong background radiation fills up the array with noise, or single pulses (pulse groups) need to measured at specific time sets. Two trigger modes are available. Both modes allow to define start and stop point of the measurement in a very specific way. In mode 1 the TTL signal starts the read-out of the wavelength meter arrays. The measurement will only stop upon a second TTL signal. In mode 2 the TTL signal starts the read-out of the wavelength meter arrays, which lasts for a user pre-defined period of time. Note: For IR-III devices, please read the manual – or contact our customer service. Why is the (re-)calibration of my wavelength meter so important? HighFinesse wavelength meters are known for their robust design due to not containing any moving parts. It is still necessary to re-calibrate the device within a suggested calibration period (see datasheet). Most of the wavelength meters have integrated calibration sources, that enable quick and easy calibration within a couple of seconds. Over time temperature and pressure drifts influence the whole calibration curve. If left uncalibrated high accuracy wavelength meter optics will possibly get shifted and tilted by temperature and pressure shifts. This can influence both the absolute and relative accuracy. Those small anomalies can be detected and eliminated by storing calibration data of not only a single wavelength value, but also the whole interference pattern of all interferometers. Note: The calibration data is saved in the installation folder of your PC. When the wavelength meter is moved to a different PC a new installation and calibration will be necessary. A transfer of the calibration data from one PC to the other is not advised. How to find the best parameters for the PID-controller? To find the right parameters and to optimize the PID-controller to have the most accurate and fastest feedback control of your laser can be a real challenge sometimes. We hereby describe a quick procedure finding the parameters P, I, D and the time constant Ta for the I- and D-calculation. This procedure is based on our PID-Simulator which estimates these parameters according to your setup- and laser-conditions. 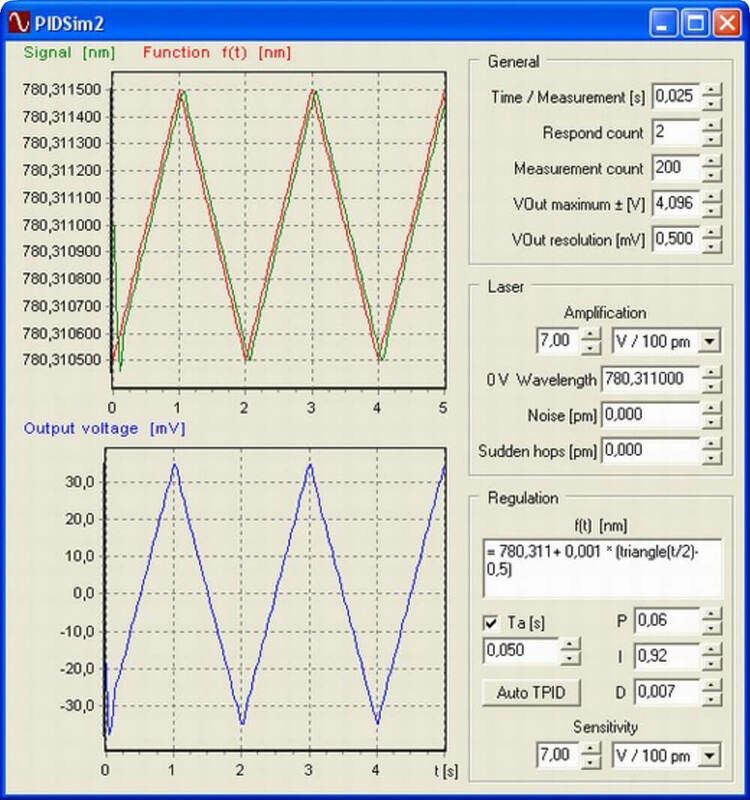 Increase the output voltage step by step and observe the max. mode hop free range and the amplification V/nm. Decrease the output voltage step by step and observe the max. mode hop free range and the amplification V/nm. It might be also necessary to limit the maximum/minimum voltage of the LC-output in order not to cause the laser to jump during the regulation (mode hop). Therefor set these values in the “Bounds”-tab in the laser control settings window. Note: The “Test”-output voltage might be not available in older software versions. Then you need to disconnect the LC-cable and apply the desired voltage by an external power supply to find out the 0 V-wavelength and the amplification. Measurement count is only for displaying the function, it has no influence on the calculation (-speed). Type in the amplification and 0 V-wavelength you determined above. Noise and Sudden hops can be left \“0\” usually. Ta, P, I and D, you can leave blank as these values are estimated automatically. The sensitivity should be the found laser amplification. Now you have entered all desired values. Press “Auto TPID” to start the iteration and wait until the “Auto TPID”-button is solid black again. The simulator now tries to find the best settings corresponding to your initial parameters. You can use these parameters in the laser control settings window and maybe adjust them a bit to optimize your feedback loop. If the controller does not work properly with the found parameters, you might need to repeat the procedure with slightly different initial values. The better you know your conditions and the laser properties, the better are the estimated values. If you change the formula in your laser control settings, you need to use the same formula in the simulator and run it again! We are always open for customer requests and happy to support you to find as quick and satisfactory solution.